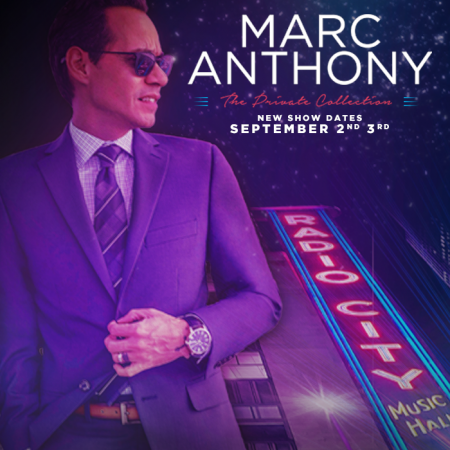 Cardenas Marketing Network (CMN) and MAGNUS Media announced today the addition of two more dates – Friday, September 2nd and Saturday, September 3rd – for the much anticipated concert series of Latin music icon Marc Anthony at the legendary Radio City Music Hall. The original announcement was made March 14th and included shows for August 26th, 27th and 28th. “The Private Collection” will journey through Anthony’s entire musical trajectory. Pre-sale for the new dates are set for Tuesday, March 29th at 10amEST – thru Wednesday, March 30th at 9:59am EST. General sale at Ticketmaster.com begins March 30th at 10:00am EST. To become a member to the Marc Anthony Fan Website and gain access to VIP package sales sing up at http://maofficial.us/FanWebsite and follow the instructions.